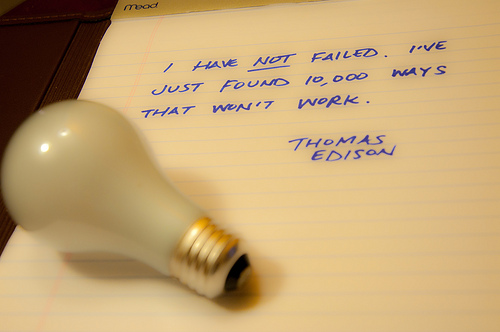 … just having a chuckle to myself looking back at my various business ventures over the years, and relating to Thomas Edison when he talks about how it took him over 10,000 attempts to invent the lightbulb. The 10,000 that didn’t work he didn’t see as failures, he succeeded in finding 10,000 ways it didn’t work. Apart from my 8 years running a business that I absolutely loved, but had to give up for what turned out to be medical reasons, my entrepreneurial spirit began at least at age 16 when my gran signed up as an Avon rep, but it was so I could do it. I couldn’t sign up myself as I was too young. I remember being the first rep in my area to win the ‘promotional bag’ that was on offer at the time. My ventures I’m sure began at an even earlier age. I’m sure I’ll remember what they were at some point. Anyway, what inspired this post was my reminder email to renew one of the domain names I own, www.datesgalore.co.uk. I was trying to set up Speed Dating events in Middlesbrough oh about 10 years ago. They were popular in the big cities like London, Manchester and Newcastle and I figured I’d give it a go. Well, I had a venue booked that would cater free food. I built the website myself where people could read about speed dating, and could book and buy tickets through the website. I made very professional leaflets and cards, all myself and by hand, laminated and everything. It cost me several hundred pounds to do. I went out onto the streets of Middlesbrough and Yarm, with the help of my younger sister, on busy nights out for people, and we had a lot of fun chatting and giving out leaflets and cards. I even got a great feature for free in the Northern Echo local newspaper about my first upcoming event. It was good. A barmaid and barman from the venue posed for the article picture, them sitting across a table from each other, me standing by with a stopwatch and a whistle. I had loads of hits on the website. I even got a ticket sale through the website. I understood that sales could be slow right up until the event because it was new and people often booked things like this last-minute on the spur of the moment, but the day before the event there was still only the one ticket sold. I ended up calling it off, because I got scared that the pub would cook food for a non-event, and I refunded the one buyer his ticket money with my apologies. This entry was posted in Attitude, Life Lessons, Relationships and tagged Entrepreneur, law of attraction, London, Middlesbrough F.C., Newspaper, Northern Echo, positive attitude, positive thinking, Speed dating, Yarm. Bookmark the permalink.